"We've had an explosion and everything's on fire" Company Comptroller Roy Westerfield told a dispatcher. A few seconds later he said "Get 'em all out of here". These were quite possibly his last words. On May 4th, 1988, a loud explosion rocked the entire Southern Nevada Valley. The ground rumbled, windows shook and, in many places, shattered completely. Residents at first thought it was an earthquake. Others who saw a mushroom cloud rising over Henderson thought a nuclear nightmare might be unfolding in the industrial city. In reality, it was an industrial disaster that occurred at the Pacific Engineering Production Company of Nevada which was commonly referred to as PEPCON. The plant, located in Henderson, was one of two American producers of ammonium perchlorate which is an oxidizer in solid rocket fuel boosters for the Space Shuttle and the military's Titan Missile program. The other American manufacturer, Kerr-McGee, was located less than five miles away from the PEPCON plant and well with-in the area that suffered blast damage. A little background information: After the Challenger Space Shuttle disaster in January, 1986, the United States government continued their contract with PEPCON for ammonium perchlorate. Despite the freeze on the Space Program, the company continued to manufacture the product at the same rate as before the Shuttle disaster. Since there was no delivery of the product going on due to the freeze and no guidance from the government as to where to ship it to, the company stored the compound on site in plastic drums. These drums were housed on the parking lots around the plant. The Las Vegas Review Journal reported in the aftermath that "nearly 9 million (yeah, you read that right) pounds of the chemical was consumed by the flames or explosions." This small explosion raised the alarm "that enabled most workers to escape before a second larger explosion occurred on the heels of the first." The Henderson Fire Department responded to the fire. When the Fire Chief arrived he saw a massive white and orange fireball and dozens of people running across the desert towards him. The second explosion happened at 11:54 and the shock wave shattered the windows in the Chief's car. A heavily damaged vehicle approached and its driver advised the chief that the danger was growing. The Chief turned around and headed towards safety. Inside the plant, Roy Westerfield was still trying to herd people to safety. He was talking by phone to a dispatcher when few seconds later he said "Get 'em all out of here". These were quite possibly his last words. It was the third massive explosion that sent Henderson and Las Vegas residents running for their windows, radios and television news. Local Channel 3 anchor Gwen Castaldi went on the air and began letting Valley residents know what was happening. "It was a real moment of urgency and tragedy in the community." (Personal interview with Castaldi, 2005). It was the third blast, according to Gregory Crosby, "that sealed the plant's fate when that 9 million pounds of chemical literally went up in smoke." The blast was so forceful that it knocked an arriving fire engine over two lanes. Another arriving fire truck had its windows shattered. Cars were overturned. 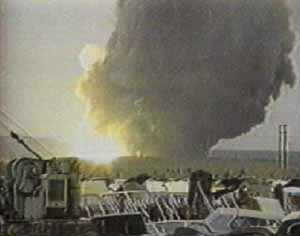 The explosion created a visible shock wave. This explosion almost destroyed the Fire Chief's car but he was able to drive to a nearby hospital to seek treatment for his passenger and himself. Inside the plant, Roy Westerfield and Bruce Halker, two employees who were shepherding people out of danger were killed. More than 300 people were injured. The marshmallow factory next door, Kidd and Co., suffered the brunt of the explosion. Due to faulty equipment there were fewer employees working that day. Those employees who were there evacuated at the first sign of trouble. The marshmallow factory was destroyed. "The final explosion went off and PEPCON basically disappeared. Boulder Highway looked like a war zone. There was glass everywhere.." Eyewitness and PEPCON employee Joe Hedrick. The last explosion registered 3.5 on the Richter scale by the National Earthquake Information Center 600 miles away in Colorado. A crater estimated at 15 feet deep and 200 feet wide was left in the storage area. A 747 on approach to McCarran Airport was reportedly buffeted by the shock wave. The Airport, 11 miles away from the blast, suffered cracked windows. An analysis later estimated the blast damage the equivalent of 250 tons of TNT. Nearby Basic High School suffered serious damage and damage was reported at McDoniel Elementary, Burkholder Middle School and Southern Nevada Vocational-Technical Center. The last blast blew out the windows at Basic High School. "We thought someone was out there with a shotgun" remembered teacher Michael Neighbors, "Like fools, we went right for the windows. We literally pushed the kids out of the building. It was like an air pocket. The back of my hair parted." (Las Vegas Review Journal). The large plume of smoke could be seen around the valley and residents throughout the valley worried about chemical fall-out. Luckily, the wind that day was only 20 to 25 mph and kept much of the chemical from settling in the valley. Local health officials predicted that lives were saved because of the winds. Damage was estimated at $74 million dollars. The nearby Fire Station was heavily damaged and there was structural damage to a nearby warehouse. PEPCON, renamed Western Electrochemical Company, relocated to Iron County, Utah. Now some 14 miles northwest of St. George, they began the relocation a mere three months after the devastating explosion at the Henderson plant. Kerr-McGee moved their plant 17 miles northeast of Las Vegas to Apex. For awhile Kerr-McGee continued to manufacture the more stable liquid form of the chemical on site. But in 1998, ten years after the disaster, the parent company of PEPCON/Western Electrochemical Company bought out the remaining ammonium perchlorate contracts and moved all production to Utah. Senior Company official, Fred Gibson, Jr tried to shift blame from PEPCON to Southwest Gas by saying that a ruptured gas line caused the fire. However, this conflicted with eyewitness testimony by employees. PEPCON attorney told the Las Vegas Review Journal, three days after the disaster, "Nothing ignites ammonium perchlorate. It does not burn. It is not flammable." Chemists from around the world immediately disputed the attorney and called the product "unstable and highly flammable." 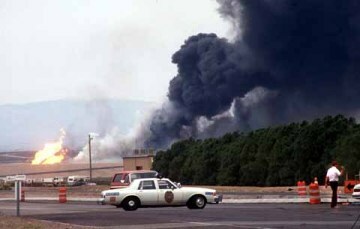 After the explosion it came out that the facility had been cited numerous times since 1974 for safety violations. There had been a small explosion in 1980 that had injured a worker. More than 50 law firms represented dozens of insurance companies and corporations in lawsuits. The case ran up tens of millions of dollars in attorneys fees and produced 1 million pages of depositions. The case wound its way through the judicial system from 1989 to 1992 when a $171 million settlement was reached before going to a jury trial. Insurance companies that had reimbursed some 17,000 claimants received almost 100 cents on the dollar. Clark County agreed to pay $3.8 million to insurance companies as a result of shoddy inspections that had taken place at the plant over the years. Southwest Gas also agreed to settle because according to their attorney "it was a practical decision made because of the uncertainty of what a jury might do at trial." (Las Vegas Review Journal). Following final arguments, the attorneys hadn't even gotten back to their offices before the call came from the court house that a jury had reached a verdict. It took less than a half hour for the jury to laugh that idea out of court. The disaster was a turning point for the development of Henderson. 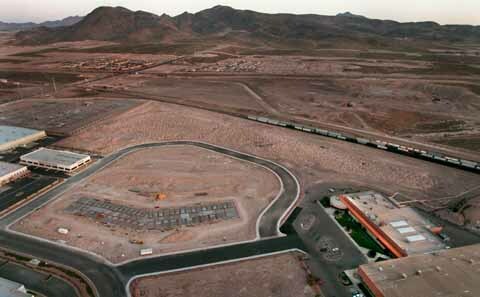 The city began to shift from being the "City of Industry" (its slogan) to a bedroom community of Las Vegas. A few years after the disaster, Green Valley subdivision, a master planned community, took off with home buyers and changed the dynamics of Henderson forever. Though many industries remain in Henderson, the city is now a growing hub of suburban dwellers looking to escape Las Vegas. The explosion as seen from Lake Mead Blvd. I remember the explosion well and wrote at length in my journal. I had been working in Special Collections just a couple of months and we were in a staff meeting in Susan Jarvis's office. Suddenly, the building rocked, literally, like a rocking horse three times. 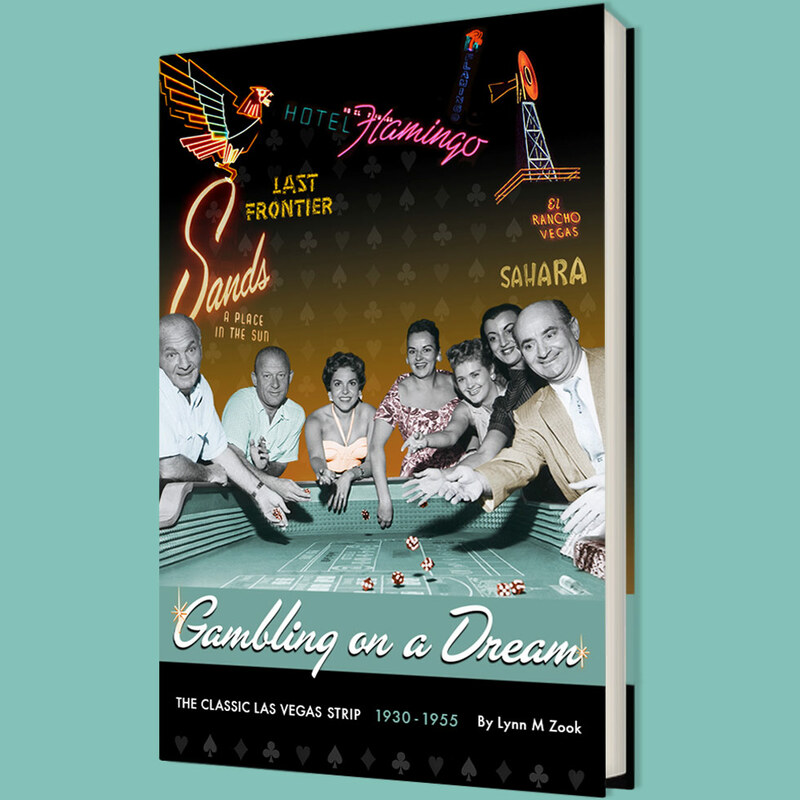 We thought it was an earthquake; at the third shock, we went out into the lobby of the fourth floor where we had an unobstructed view across Las Vegas to the plants in Henderson and the enormous plume of smoke rising over the city. We evacuated the building--which we then figured out wasn't a good idea in case wind moved the toxic fumes in our direction. I still lived in Boulder City then; my brother was an employee at Kidd and Company next to the PEPCON plant, and my first thought was he was dead. His son, my nephew, was in school not far from the plant, and I worried about what might have happened to him. My mother, who worked in Boulder City for Central Telephone Company, that day happened to be in Las Vegas at a training class, so my family was scattered all over the Las Vegas Valley. I left work right away and tried to get home; Henderson was sealed off, so the only way I could get back to Boulder City was around Sunrise Mountain and the Northshore Road, along Lake Mead and into Boulder City the back way. My brother was the last Kidd Company employee found alive, hours later, wandering through the wreckage. His photograph made it into papers across the country. My nephew had been evacuated to Boulder City with busloads of Henderson school children, and they were sitting up in Government Park. I eventually found my brother sitting at the bar at the Backstop Sports Pub in Boulder City nursing his fifth or sixth drink, his clothes still in tatters, in shock. Nobody that day knew where anybody else was; parents whose children were evacuated didn't know their kids had been taken away or to where. It was chaos and terror.